Something about Christmas makes me want to make stuff. It’s like I’m an elf. I just might be; ELF is my initials after all… Enough of my secrets, though. After making my own lovely Christmas stockings, I had to make a tree skirt to match! It’s only right, after all. I have 2 trees so I had to make 2 tree skirts. My first one was a pretty patchwork for the main tree. I didn’t take pictures as I went because I was trying to figure it out. 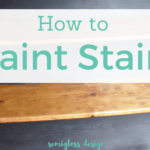 But I made a 2nd smaller DIY Christmas tree skirt for the other tree and I explain at the end of the post how I made the patchwork one. 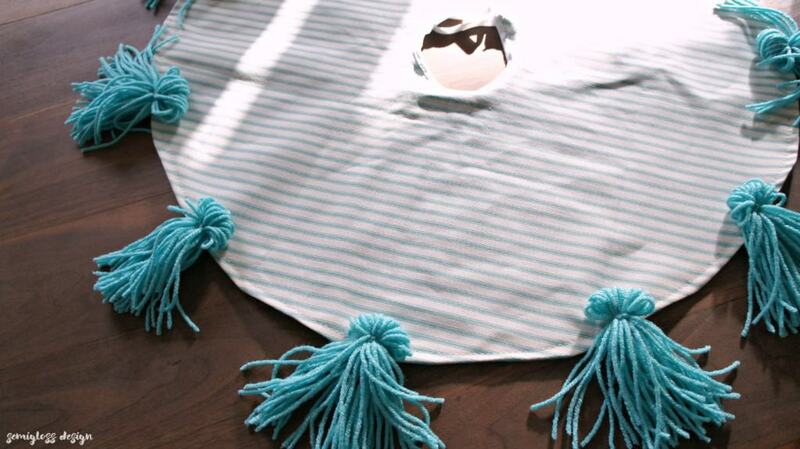 Plus I made a bonus tassel tutorial! 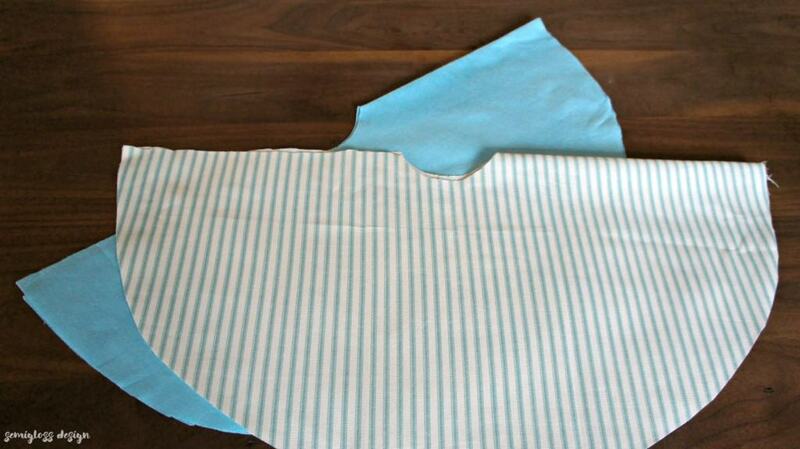 Fold an old tree skirt in half and use it as a pattern. 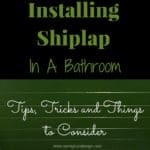 Cut around the edge, leaving about 1/4″ around it. 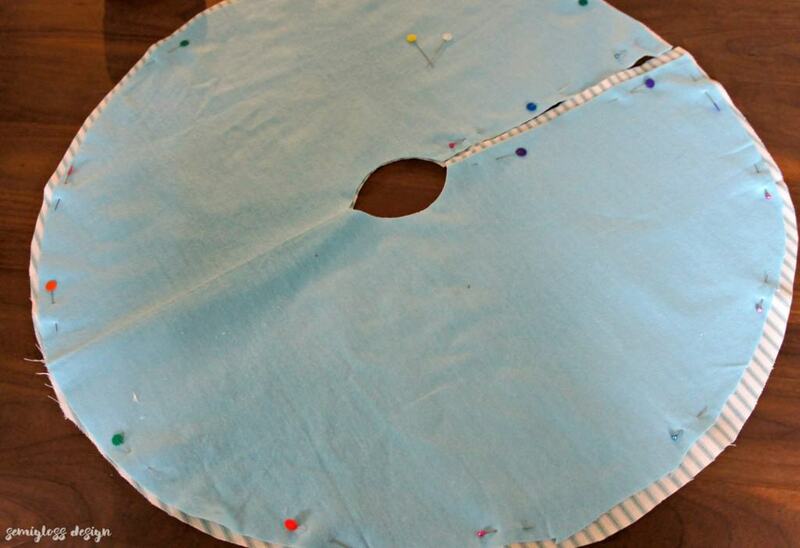 If you don’t have an old tree skirt to use, follow this tutorial on how to make a circle. 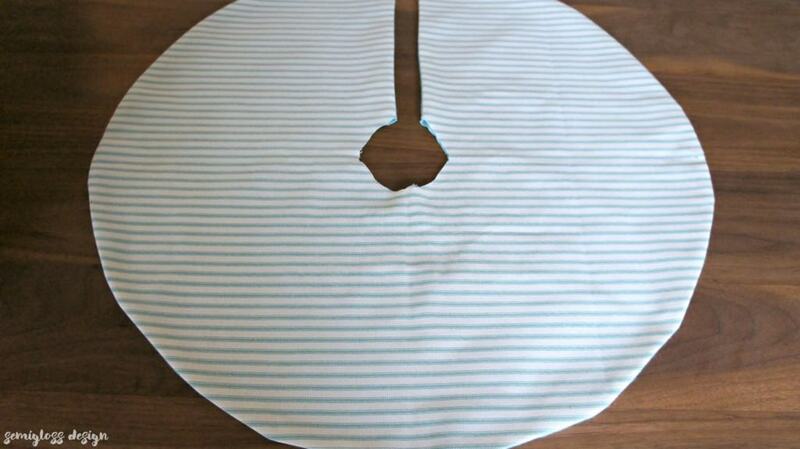 Cut another circle for the top fabric as well. 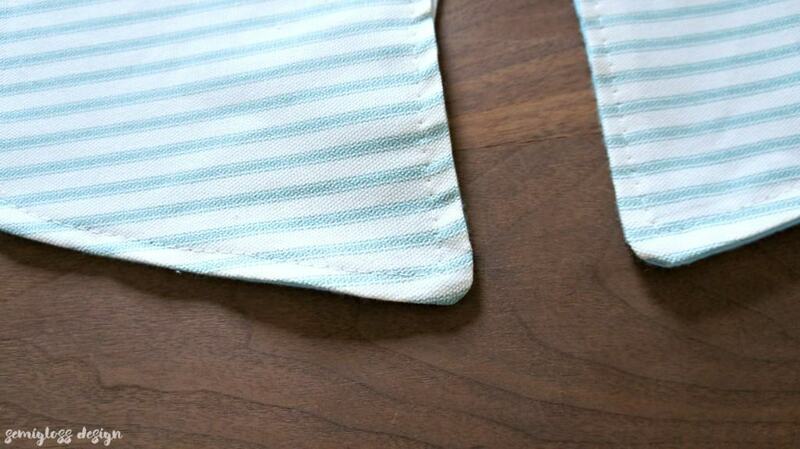 I used an aqua flannel for the lining and an aqua ticking for the top fabric. 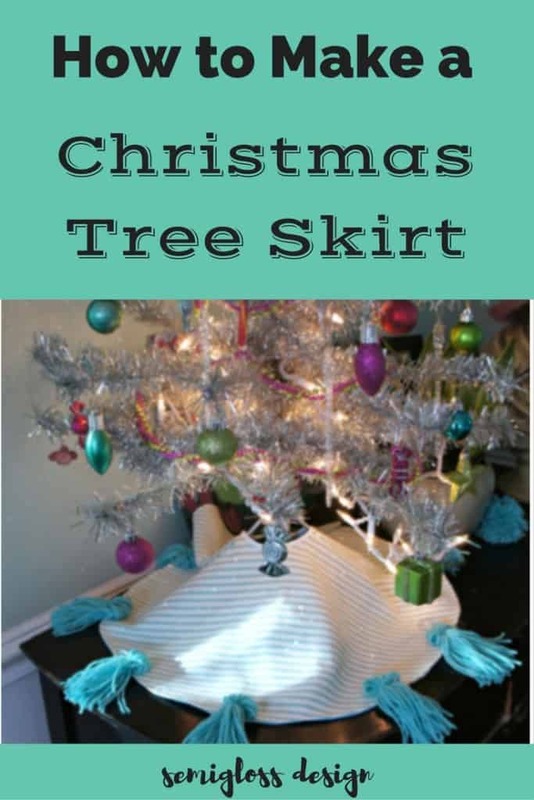 Be sure to cut a slit on each piece for the tree skirt to fit around the tree. 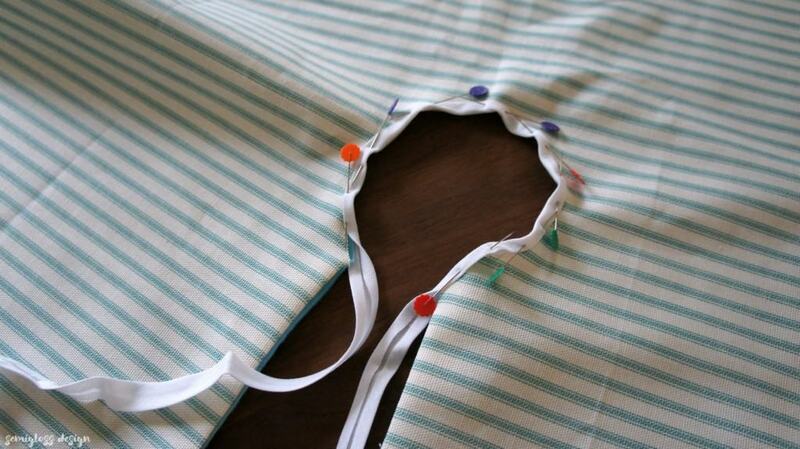 Place the fabrics right sides together. Pin around the edge and sew around, leaving the center circle open. When it’s sewn together, clip around the edges. 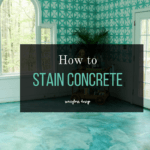 Cutting slits will help it look better once it’s flipped and ironed. I also cut away any excess fabric. 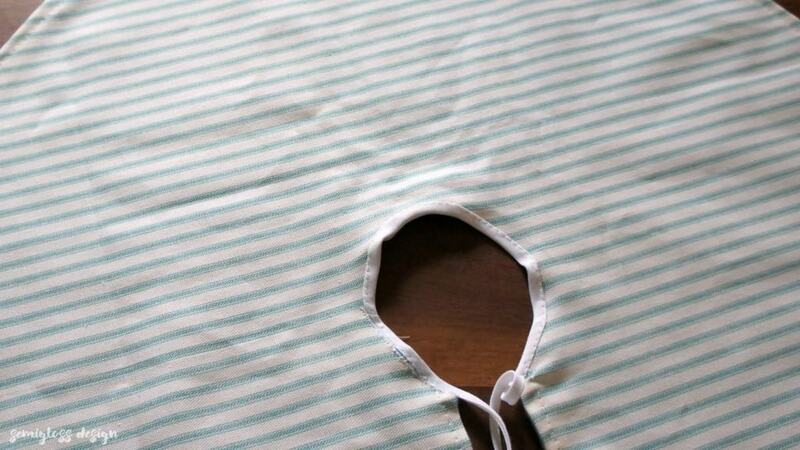 Flip the skirt inside out and iron it. Sew around the edge, going very slowly. 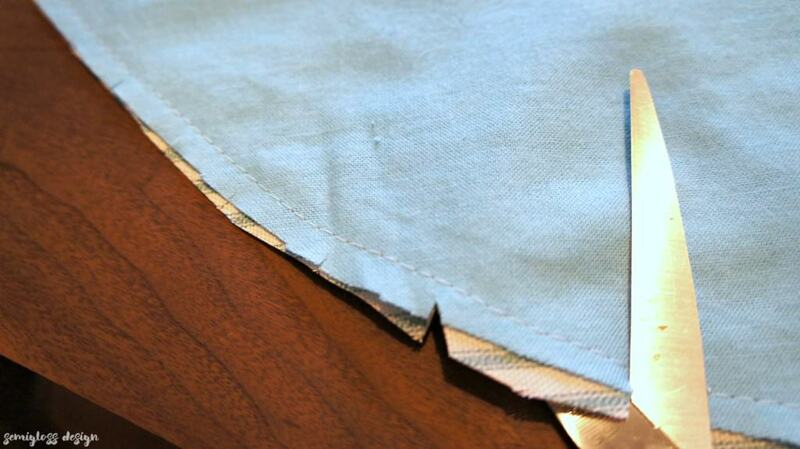 Sew the ends of the tape to act as a ribbon for tying it shut. Top stitch the edge around the edge of the skirt. 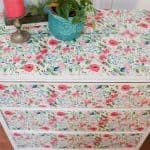 This gives it a nice, finished look. It can be done at this point. OR we can make it super fun and add tassels. Or add ribbon, ruffles, rickrack or pompoms. Grab your supplies. You need yarn, scissors and something to wrap the yarn around. I’m using a journal because it’s about the right size that I wanted. A cell phone would have worked nicely too! 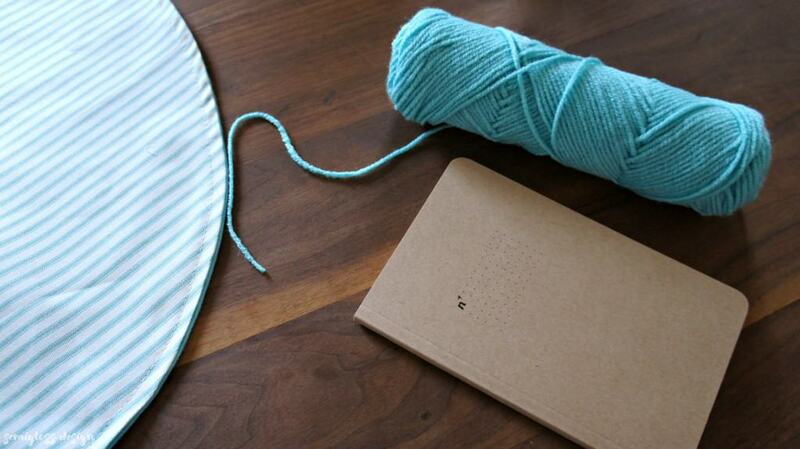 Start wrapping yarn around the journal. 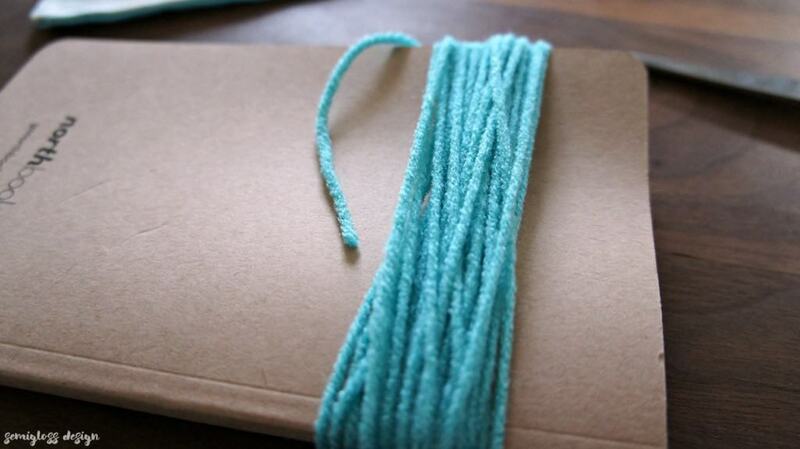 When you think you have enough yarn, slip the loop off of the journal. 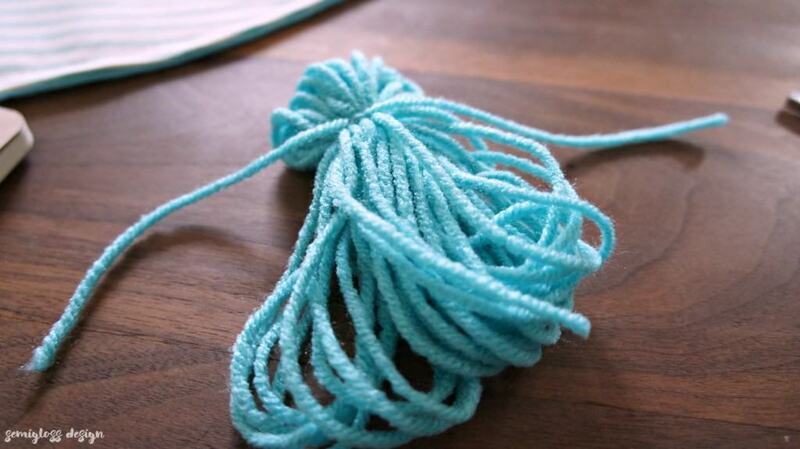 Cut a piece of yarn about 10″ long and tie it around the top part of the loop. 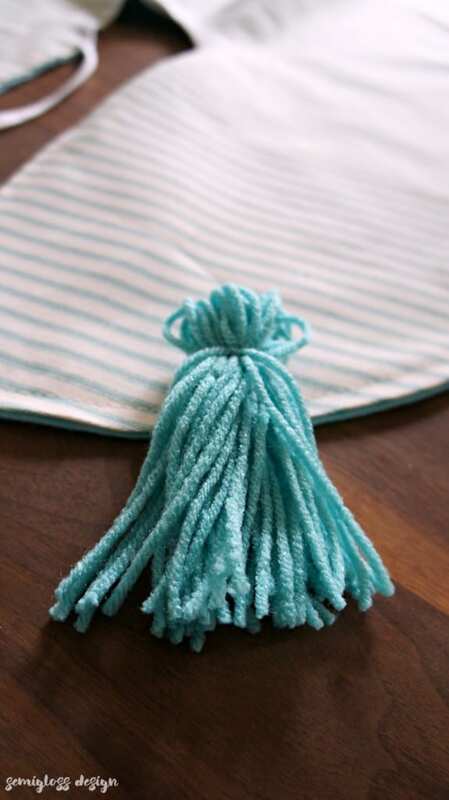 Cut the long loop to make tassels. It might need some trimming. 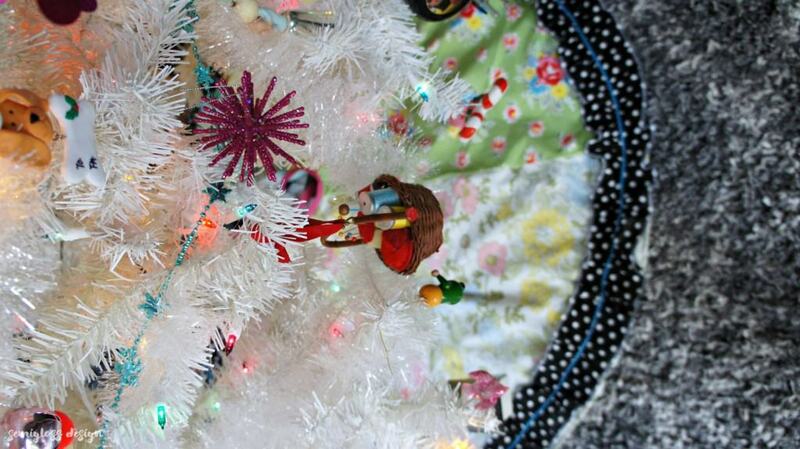 Sew your tassels to the tree skirt. I made 7 to go around my tree skirt and spaced them equally around the front and sides. Isn’t she a beaut? 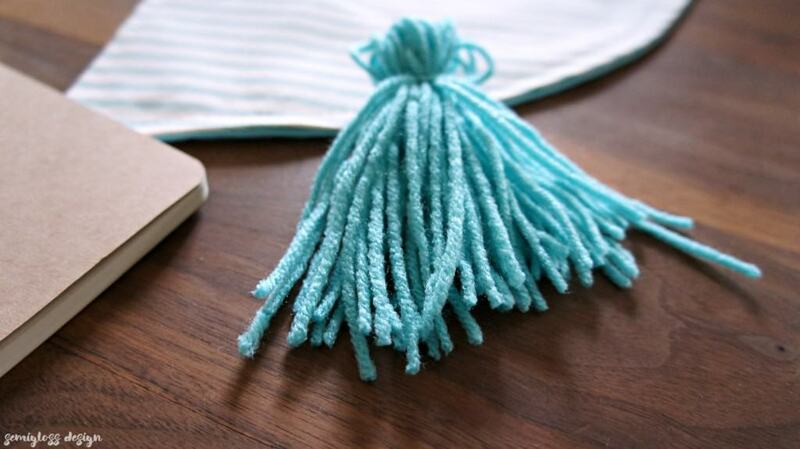 Did you know that ticking and tassels could be so perfect together? I didn’t take photos while I made the large tree skirt, but it’s the same concept, just with patchwork and trim. I folded the existing tree skirt into sixths for my patchwork pieces, cut around them and sewed them together. The other steps are the same. 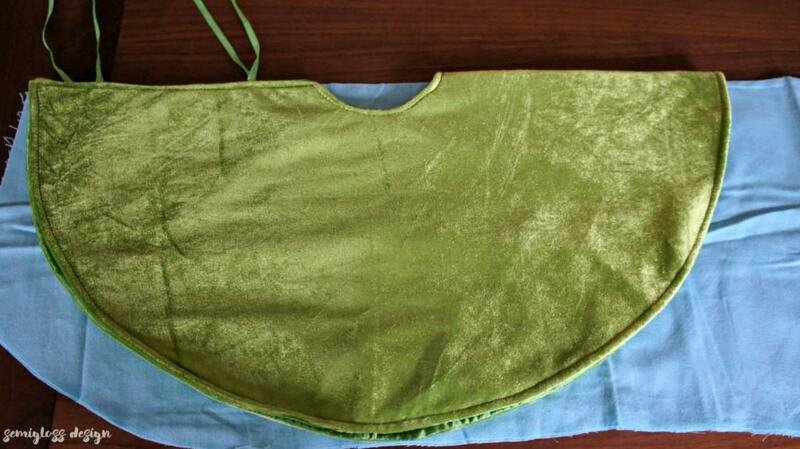 When it was done, I sewed a ruffle around the edge instead of adding tassels. 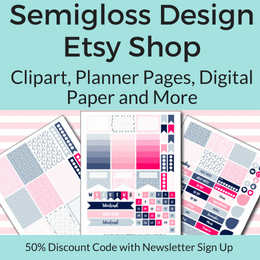 Looking for more crafty Christmas posts? i love this! so fun! 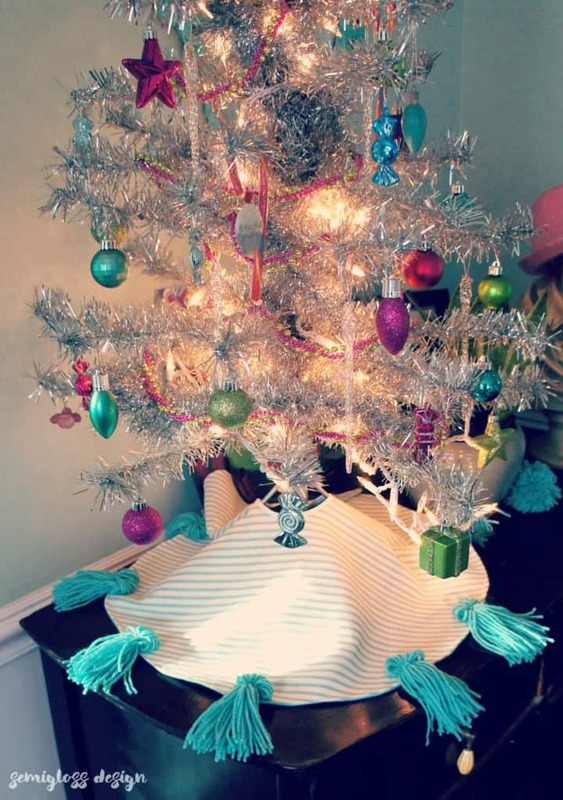 you made this and ariel made one with pom poms and tassels (pmq for two) and now i want to make one for next year! of course i know me… i will say, next year i will… and then december will be here before i blink! Thanks Cassie! I’ve been meaning to make new tree skirts for years, but I’ve never actually done it until now. Ariel’s tree skirt is so amazing. That is so fun! You have such an eye for delight! Thanks Rane! Tassels make everything fun!